“When walls go up, walls come down”. It takes a Village. As I mentioned yesterday, I am taking this week to focus on the idea that “It takes a Village”. As this started as an African proverb, it has now been further repopulated but notable community and global leaders such as Hillary Clinton, Malaak Compton – Rock (yes, Chris Rock’s wife but a massive force in the advocacy world with a bestselling book called, “If it Takes a Village, Build One”) who take the concept beyond that of raising a child, to raising our global community. On a local level, as I mentioned, this weekend I had the honor of working on a build site for local LA families who are in the mid-stages of literally building a community housing project. 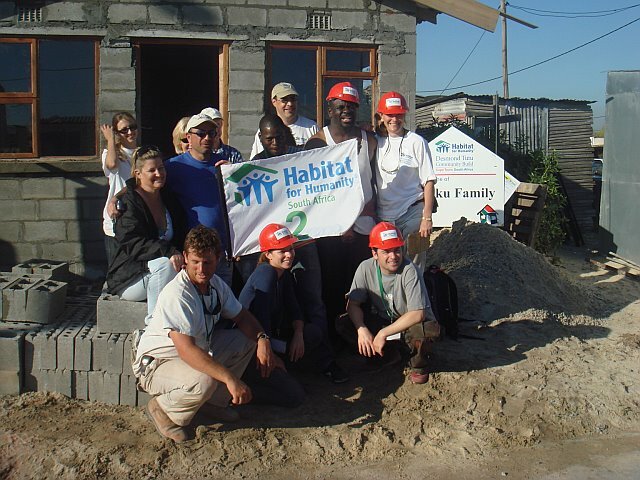 This was not my first Habitat for Humanity Build, as KSP and I did a build in South Africa in 2007 which was a life-changing experience for me. In Habitat, there is a saying that “As the walls go up, walls come down” and this could not be more true. One of the fundamental principles of Habitat for Humanity is that this the opportunity to receive the home is not a handout. Homeowners must both put in 500 hours of “Sweat Equity” as well as repay a no-interest Home Loan. To give you an idea of the magnitude of homes that are being built, “a home is finished EVERY 5 minutes” and Habitat has become the largest home developer in the US. That means that each of those families has put in 500 hours of labor to help finish their homes and when you think of the socio-economic level of the folks building, not working is not an option. So the experience is definitely a family affair and the message that this sends is a universal language, we all have to work together and helping your neighbor is an amazing start. When KSP and I went to Africa, we worked in shanty town just outside Capetown. The roads were dirt and existing homes made of tarps, wood scraps and corrugated aluminum for the roof. To say the people were impoverished would not begin to communicate their circumstances. Yet somehow as we worked along side our homeowner and his brothers so that he could build a house for his children to come visit, I learned an immense amount about humanity, compassion, fortitude, and love. There were two events over the course of 5 days, that we mixed cement, made human brick chains to pass the cinderblocks that would be the walls, created window and door frames, scaled walls to attach the wood and tiled roof, and made a door through which this family could pass through everyday into their new home. The first happened one day as I was taking a short break to eat a balance bar and nurse my aching muscles. I was standing outside a family’s home talking to one of my build partners. As we chatted, a little girl about 2 years old wandered out of the gate to her yard and into the dirt road where were talking. She was knee-high to a grasshopper (yes I am from Oregon and still a little country mouse) and was chewing on a chicken bone. As she toddled toward me, I knelt down to say hello. I looked at her dirty little face with her big brown eyes shining at me and said “hello, sweetheart”. She looked me right in the eyes, walked up to me, grabbed both sides of my face with her tiny hands and kissed me dead on the lips. I nearly burst into tears but my smile and heart exploding prevented me from actually frightening her with my tidal wave of emotions and I grabbed her hands and said thank you my sweet girl. She smiled, turned around and went back through the gate from which she came. Me: How are you feeling? Homeowner: So happy, my sons will love this house. They will come from their mother today to see it. Me: That’s so great. I am so happy this will help you. Homeowner: I cannot understand why you Americans would come all the way here to help us. You spend your own money to come help us. Me: We are so happy to be able to help. This is a wonderful experience. And we are so happy to meet you and your family. Homeowner: I can never repay you, but I know one day, if I don’t see you again in this life, I will see you on the other side. Me: Crying, tears, big fat tears. Choking and nearly sobbing…we are the lucky ones to have met you and your family. He hugs me (probably thinking I am a crazy lady but he has know me for 5 days so he probably also wasn’t too terribly surprised. Time stood still. Between now and then I have done a few more builds locally, but this past Saturday build was special in that the Homeowners were building with us again. I watched in awe as I was on grouting duty with my new friends BB and JRB, and the 19 year old daughter of one of the homeowners comes swooping in to our wheel barrow of mortar and takes a huge shovel full and walks it back to where she is working on the other part of the patio. As I watched her I thought about just how proud her mother (who I later found out is a single mother of 2 girls) must be. Coincidentally, later that day during the lunch break, BB and her daughter and I ended up sitting with this particular homeowner. She told us about the various families that were out building today and how a few of them were single mothers. Since you have to be 16 to be on the build site, it’s very challenging for the mothers with younger children. Especially because, their children cannot be on the site and they must work during the week to put food on the table. BB and I asked her various questions and then she told us that because a few of the families had older children who were able to work on the weekdays towards the family’s mandatory hours (like her own), when the weekend hours came and the mothers could work, the children (16 and above) would donate their hours worked on the weekends to the families with small children. I mean, seriously, how amazing is that? It is an ultimate gift and demonstration of taking care of your neighbors. She went on to joke about how sad they were that the walls were going up in the townhome style homes because then they wouldn’t all be together anymore. As I sat there and listened to her, it reminded me how amazing the human spirit can be when we give back to others and how meaningful and inspiring can be for the rest of us to make even small changes or take a small step to help someone we love or a complete stranger, if only for a day. This community of people were a small village that were raising one another’s children and one another. The ripple effect of their love and kindness enveloped all of us who came in for the day and left many of us wanting to do more. It is my small offering to help other parents, patients and people who get thrown into a system that is not designed for them. Like Malaak Compton-Rock’s book is titled,”If it takes a village, build one.” To me this means, you can start in any small way, donate old clothes, furniture, volunteer for an afternoon or a day, help your neighbor by taking care of their pet or watering their plant or just offering to help if they need it. It will make you feel inspired and the ripple effect of these efforts extend far beyond what you will know as the inspiration is viral. So make today ‘yournewfavoriteday’ and do something small and simple to help someone. Happy Tuesday! Your inspiring…Knock em “dead” tomorrow and advocate for our children…Proud to be friends with you. Your amazing! Thanks! Doing this for all of us! Talk to you when I get back. good luck tomorrow. Thanks Katie. Yes, that was a special trip! Love you my friend. The last comment was from me! You are inspiring and amazing – it brings me back to our times in Mexico. Being part of your community always gives back more than you give. 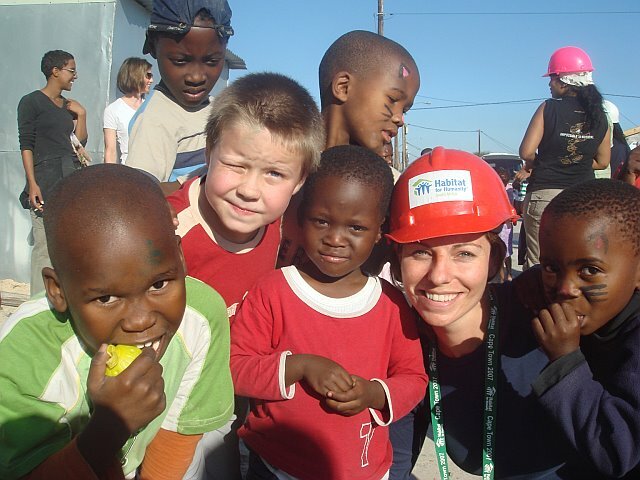 Our family, together, takes on a community project each year – so rewarding! my wife rules….thanks for being in my life….i love you so much and happy birthday.